Application forms (in prescribed format) are invited by Central Bank of India from male or female aspirants to fill up the vacancies of Credit Officers, Risk Managers and Economist on direct recruitment basis. 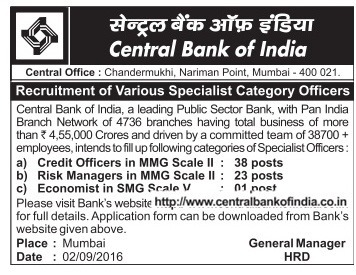 As per notification of Central Bank of India, Total available posts are 62. Application mode is offline. Last date for receipt of completed application form is as soon as possible. The official notification of Central Bank of India Recruitment 2016 has been uploaded. Total information regarding these posts (Credit Officers, Risk Managers, Economist) like educational qualification details, age criteria, pay scale, selection procedure, application fee etc is mentioned below. 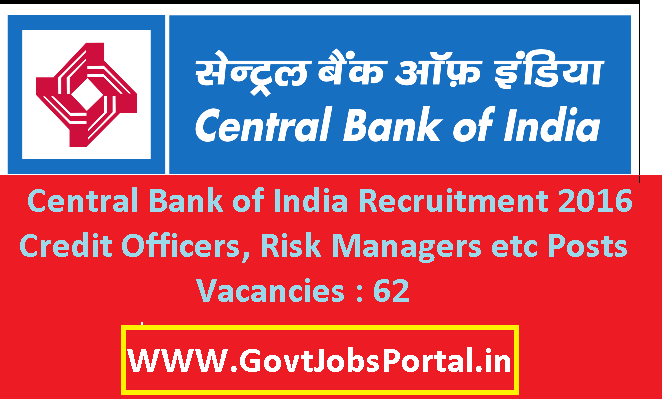 Read full information for Central Bank of India recruitment 2016. Last date for receipt of completed application form is as soon as possible. Qualification for candidates should be graduation degree or post graduation degree from a recognized university/Institute. To get age limit details for Credit Officers, Risk Managers, Economist posts candidates please visit official notice. Central Bank of India selection committee will conduct a test/interview to select candidates for above positions. Central Bank of India selection committee requires hard copy of application forms i.e. Application mode is offline. Last date for receipt of completed application form is as soon as possible. A) Download application from Central Bank of India website. B) Fill the details of name of the candidate, DOB, Educational information etc. C) Attach required testimonials to application form and send to given address. D) Address is "Central Bank of India, Nariman Point, Mumbai-400 021". Candidates may send applications to given address before the due date through speed post / registered post only. Application should be made in the language of English only. Fill the form neatly with blue colour ink pen in all capital letters.